The 3.6 release adds two major new features to REST framework. Built-in interactive API documentation support. Above: The interactive API documentation. The 3.6 release would not have been possible without our backing from Mozilla to the project, and our collaborative funding model. If you use REST framework commercially and would like to see this work continue, we strongly encourage you to invest in its continued development by signing up for a paid plan. Many thanks to all our sponsors, and in particular to our premium backers, Rover, Sentry, Stream, Machinalis, Rollbar, and MicroPyramid. Support for various authentication schemes. The coreapi library is required as a dependancy for the API docs. Make sure to install the latest version (2.3.0 or above). The pygments and markdown libraries are optional but recommended. 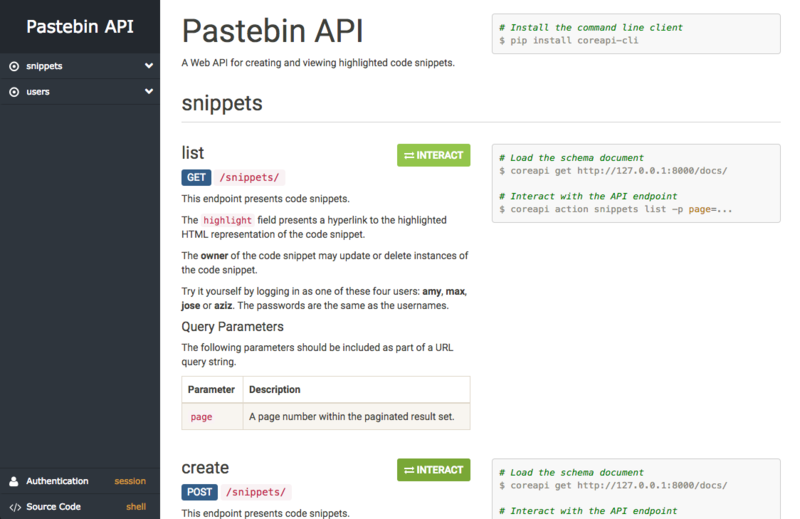 We'll likely be making further refinements to the API documentation over the coming weeks. Keep in mind that this is a new feature, and please do give us feedback if you run into any issues or limitations. For more information on documenting your API endpoints see the "Documenting your API" section. Loading the client library and schema. Making an API request using the client. The client is not limited to usage with REST framework APIs, although it does currently only support loading CoreJSON API schemas. Support for Swagger and other API schemas is planned. Previous authentication support in the Python client library was limited to allowing users to provide explicit header values. We now have better support for handling the details of authentication, with the introduction of the BasicAuthentication, TokenAuthentication, and SessionAuthentication schemes. You can include the authentication scheme when instantiating a new client. For more information see the Python client library documentation. The 3.5 "pending deprecation" of router arguments for generating a schema view, such as schema_title, schema_url and schema_renderers, have now been escalated to a "deprecated" warning. Instead of using DefaultRouter(schema_title='Example API'), you should use the get_schema_view() function, and include the view explicitly in your URL conf. The 3.5 "pending deprecation" warning of the built-in DjangoFilterBackend has now been escalated to a "deprecated" warning. Support for private API docs, requiring login. Automatically including authentication details in the API doc code snippets. Adding authentication support in the command line client. Improved support for documenting parameter schemas and response schemas. Refining the API documentation interaction modal. Once work on those refinements is complete, we'll be starting feature work on realtime support, for the 3.7 release.